Morakniv knife blade blanks are an excellent choice for anybody wishing to make their own custom knife. The Classic No. 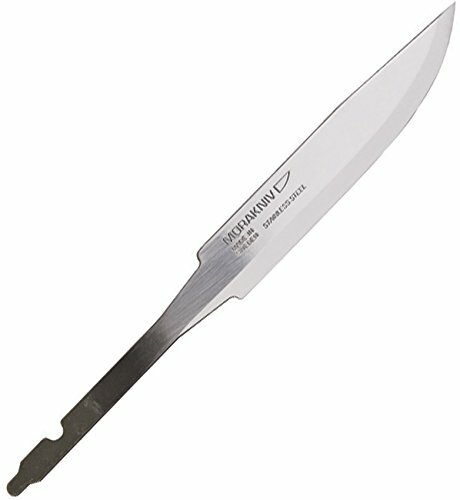 1 knife blade blank features a 3.9-inch Sandvik stainless steel blade which is ideally suited for marine, fishing, outdoor and construction applications where knives see hard use and are commonly exposed to dirt and moisture. The chromium content of stainless steel makes them less susceptible to corrosion and oxidation than carbon steels, giving them a longer life overall. Mora Knives are made from high-quality Sandvik steel. Sandvik knife steels are characterized by ultra-fine carbides that result in superb forging and hardening properties. The absence of large carbide deposits promotes excellent edge sharpness for optimum cutting performance. Morakniv has been manufacturing the highest-quality knives in Mora, Sweden since 1891. Professionals worldwide trust the quality materials and fine craftsmanship of Morakniv. Knife blade blank only, does not include handle or sheath. Celtic Pocket Knife Black - Original Gift -, Beautiful product -, Hand Forged Knife.Hardened Blade, Vintage, Art Collection, Antiquity, Great.Beautiful Product.